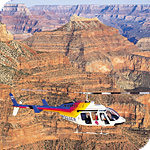 PLEASE NOTE THAT THIS TOUR DEPARTS FROM THE GRAND CANYON'S WEST RIM, NOT THE SOUTH RIM!!! Combining our exciting "Over The Edge!" tour with a pontoon boat cruise along the heart of the mighty Colorado River after a breathtaking descent 4,000 feet to land smoothly on the floor of the Grand Canyon. You will marvel at the canyon's legendary beauty as you witness the unfolding canyon landscape! Included is a barbecue meal. Take in the wonder of the Colorado River on a short boat ride and a scenic tour above the Grand Canyon.